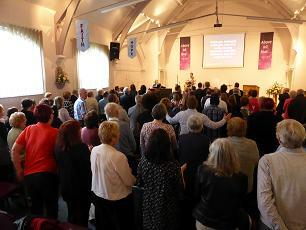 Sunday Morning Service	-	Each Sunday at 10.40am. After the service there is a ministry team available to talk and pray with you. Refreshments are also available at this time. Children's Ministry (CBBC) during the Sunday morning service. Mornings - Tuesday and Fridays at 8:30am. Evenings - Tuesday at 7.30pm. Life Groups meet at various times during the week, follow link for more details. Dads at BBC meet 3rd Saturday of the month (not August) 10am-12pm, follow link for dates and more information.